Split() Function returns one dimensional array containing the substrings, after splitting the main string based upon the delimiter provided. No of substring to be returned. The type of com­par­i­son to find the string in the main string, like vbBina­ryCompare ( Value =0), vbTextCom­pare (value=1). 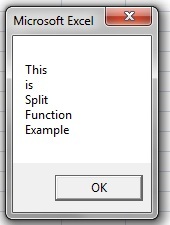 strMainString = "This is Split Function Example"
it is very helpful to learn vba. 215 queries in 0.089 seconds.